Lumbar facet joint syndrome is very common in the lower back region of L4 to S1. Occasionally, facet joint pathologies are located in the upper lumbar spinal zone, usually at the frontier of T12 and L1, also called the thoracolumbar juncture. Lower back pain from facet syndrome is a growing diagnosis in both numbers and scope. This is no surprise, since lumbar pain is the most common chronic symptomatic syndrome worldwide and has literally affected the majority of adults on this planet in some significant way. The lumbar spinal region is one of the most important areas of the human backbone. It is directly responsible for some much of the form and functionality that make us uniquely human. Unfortunately, all the stress that impacts the lumbar region can cause the structures there to deteriorate quickly, considerably and sometimes pathologically. The facet joints are no exceptions to this rule of spinal aging. 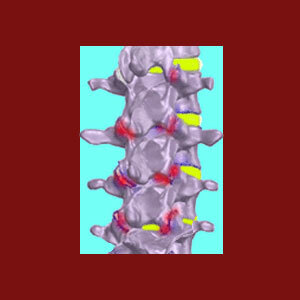 This vital dissertation profiles the occurrence of lumbar facet syndrome. We will explain why the lower back is so susceptible to apophyseal joint degeneration and what type of symptoms the condition generates in the greater regional spinal anatomy. The lumbar spine consists of 5 vertebral levels named L1 through L5. L1 joins with the lowest thoracic vertebra at the thoracolumbar frontier, while L5 joins with the sacrum are the lumbosacral juncture. This latter location is the site of the most noticeable degree of degeneration in most human spines. The lumbar spinal facet joints are very strong and must manage extreme stresses during day-to-day life. The lumbar vertebrae carry the majority of the body weight and must support and stabilize this burdensome mass through an exhaustive range of motion. Most of the facet joint deterioration is seen at the same levels as other degenerative effects of age and activity, namely L4, L5 and S1. Less commonly, patients might express facet joint pain at the juncture of T12 and L1. Multiple vertebral levels of facet joint syndrome are common in the lumbar region. The lumbar spine endures tremendous forces on a daily basis. The effects of all this activity are substantial on the lumbar anatomy, which is typically the very first spinal region to demonstrate marked deterioration structurally at the earliest age of onset. The lumbar discs will generally display signs of desiccation, as well as possible herniation, and these changes will encourage the osteoarthritic processes to set in. Since the lumbar region supports body mass and the vertebrae move closer to one another due to the intervertebral deterioration, the facet joints will often show signs of age and activity by the age of 30 to 40 in most adults. People who have been particularly active, or have participated in certain activities like martial arts, gymnastics, yoga and other pastimes involving spinal flexibility, might demonstrate these changes earlier in life and more significantly. People who perform physically demanding jobs are also likely to display facet deterioration at a younger age. Additionally, since the general arthritic processes tend to act on all the various parts of the lumbar spine, facet joint osteophytes here have an increased chance of contributing to neuroforaminal narrowing. This loss of patency in the foramen provides a greater likelihood of compressive neuropathy occurrence, particularly at the L4, L5 and S1 levels. Finally, additional irregularities in the structure of the lumbar spine are usually contributory factors to the development of facet joint syndrome, particularly when these atypical issues tend to misalign spinal bones in each joint. The most common of these conditions include lumbar scoliosis, hyperlordosis, hypolordosis and spondylolisthesis. As with other cases of symptomatic facet syndrome, lumbar apophyseal pain will usually be extremely localized. However, since multiple zygapophyseal joints might be symptomatic, the expressions might seem to envelop much of the lower back, adding difficulty to preliminary diagnostic processing. Pain will virtually always be worse on particular movements of the lumbar spinal joints. Stiffness in the lower back is commonplace and might be disturbing to very active patients, more than the pain itself. Pain that extends far off center in the spine, or affects truly large regions, may indicate a different diagnostic verdict than facet syndrome. Keep this in mind if your diagnosed facet pain does not present a typical clinical symptomatic profile, since mistaken diagnosis of facet syndrome is a major problem. Compressive neuropathy enacted by lumbar facet bone spurring will affect the buttocks, legs and/or feet. The typical symptomatic expression is called sciatica, since it can be traced to the nerve roots that eventually create the sciatic nerve. Sciatica is one of the most common and stubborn of all chronic dorsalgia conditions and we cover the topic in full on our dedicated sister website, Sciatica-Pain.Org. If you are suffering from sciatica symptoms, this website is the most comprehensive resource available anywhere to help you.